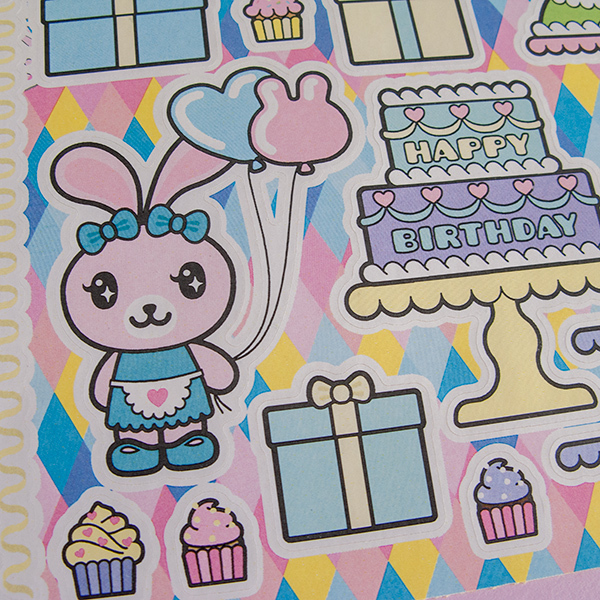 Funny Bunny Sticker Sheet: Happy Birthday! Funny Bunny stickers sheet: Happy Birthday! This graphic I made for Blythecon Tokyo 2016 to celebrate the 15th anniversary of Neo Blythe. 100% oiriginal design! This sheet is printed in my atelier on our laser printer and then cut manually on the cutter machine. So it is entirely made here. With saying that this sheet is not super perfect like those factory made stickers. Have it in mind when buying. Buying this you will get one sheet.